Every January 6th, on El Día de los Reyes, Santa Claus and reindeers are traded in for wise men and camels. Celebrated throughout Spain and Latin America, kids leave shoes out along with grass and water for the camels in exchange for presents the Reyes Magos will leave behind. Growing up, it was one of my favorite holidays because it meant having at least one more gift to open. 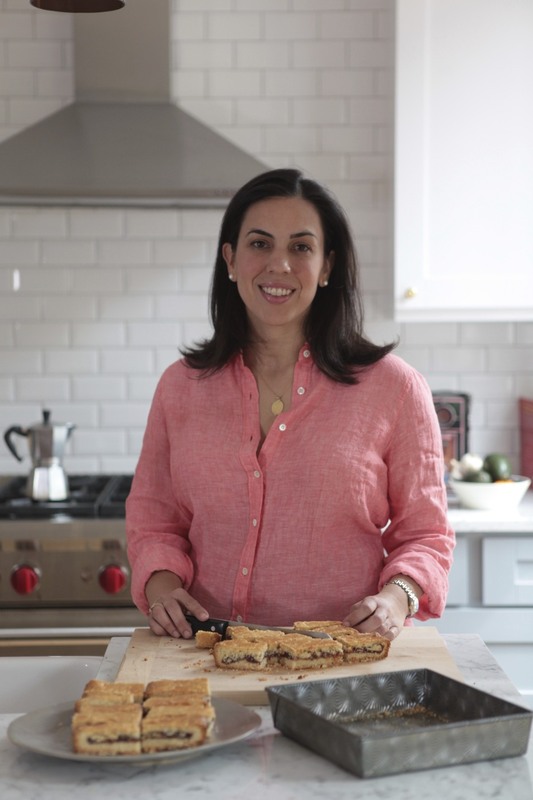 This year I forgot to leave my shoes out last night and if the camels came looking for straw they were disappointed but I still wanted to post my favorite recipe for Rosca de Reyes. While it’s not officially observed in the United States, small community parades and quieter family celebrations mark the day. 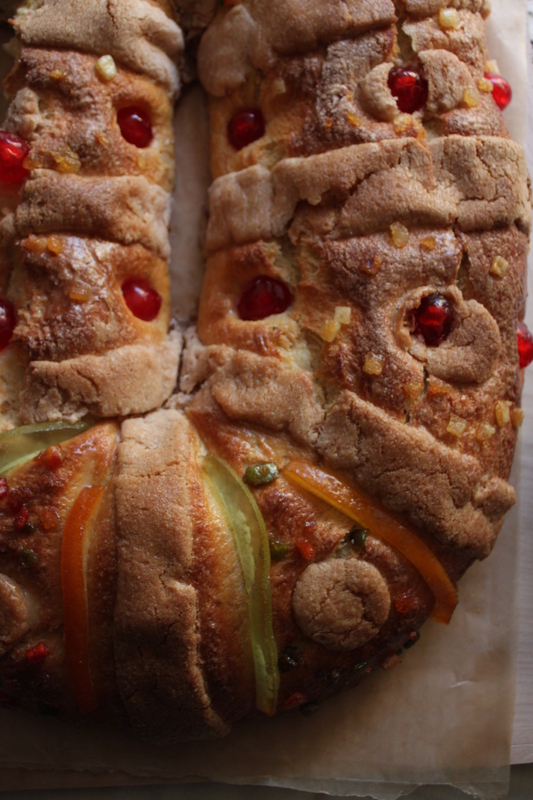 At the center of it all is the rosca de reyes, a direct descendant of the Spanish roscón de reyes and cousin to Mardi Gras’ Louisiana king cake. 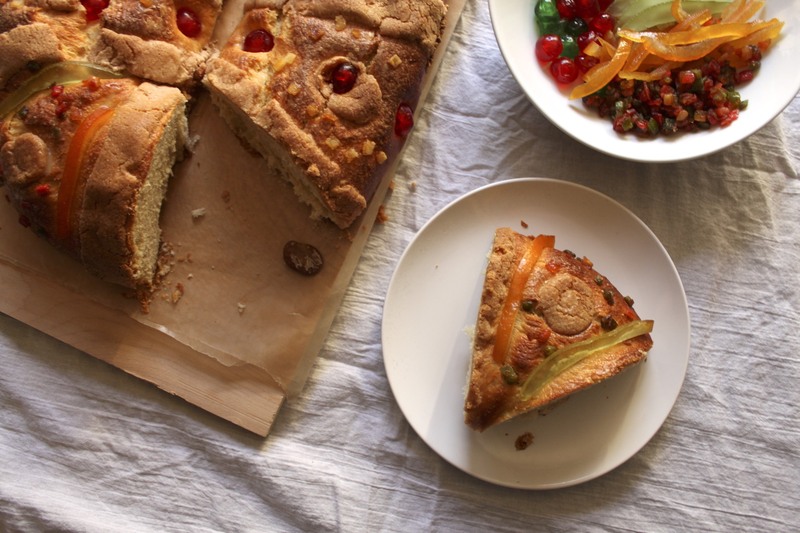 A sweet, brioche-like bread, it’s baked into a wreath or crown shaped loaf and decorated with candied fruits. A bean or baby figurine is tucked inside and whoever finds it may host Candelmas dinner the following month or provide next year’s rosca. While traditions vary, it’s really just another way to keep the celebration going. Combine the milk, sugar and yeast in the bowl of a stand mixer. Let it stand until it begins to foam, about 10 minutes. Using the paddle attachment, add the eggs, rum, salt, vanilla, cinnamon, anise seeds, orange zest, and lemon zest to the yeast mixture and stir at low speed until well-incorporated, 1 to 2 minutes. Add the flour, one cup at a time, alternating with the butter, until both are well incorporated, about 3 to 5 minutes. Switch to the dough hook attachment Increase the speed to medium and continue to beat until the dough is smooth and pulls away from sides of bowl, about 15 minutes. Pour the dough onto a lightly floured surface and shape into a ball. Place the dough in a lightly oiled bowl, punch it down, reshape it into a ball, and turn it over once. Cover the bowl with lightly oiled plastic wrap and place in a warm draft-free place. Allow to rise until it doubles in bulk, about 1 to 1½ hours. At this point, it can be refrigerated overnight. Bring to room temperature before proceeding. Prepare the sugar topping if using. Beat the butter in a small bowl until smooth. Add the flour, confectioner’s sugar, and cinnamon and beat on low speed until incorporated. Add the lemon juice and beat until it forms a smooth, pliable paste. Set aside until ready to use. Turn the dough out onto a lightly floured surface. Roll the dough into a large log shape then join the ends to create a wreath with a large hole in the middle. Brush the tops of the rolls with the egg wash and sprinkle generously with sugar. Shape the sugar topping into desired shapes and distribute across the cake evenly. Decorate the cake with candied fruits. Tuck the fava bean or figurine into the bottom of the dough. Bake until golden brown, about 35 to 40 minutes. Remove the bread from the oven, take them off the baking sheet, and let them cool on a wire rack. Serve with hot chocolate. 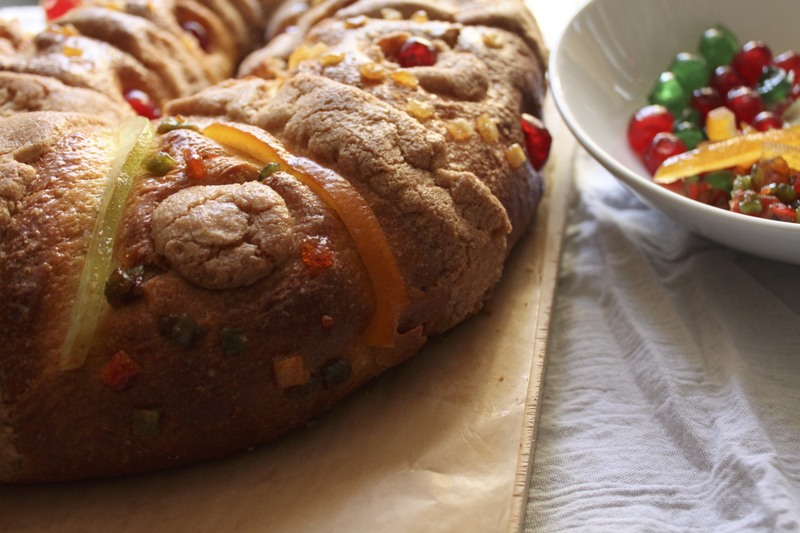 Beautiful, I love the colors and the look of you Rosca de los Reyes. I made the Swiss/French version today! This looks amazing! Love the pretty fruit. This is absolutely beautiful and I love the tradition. 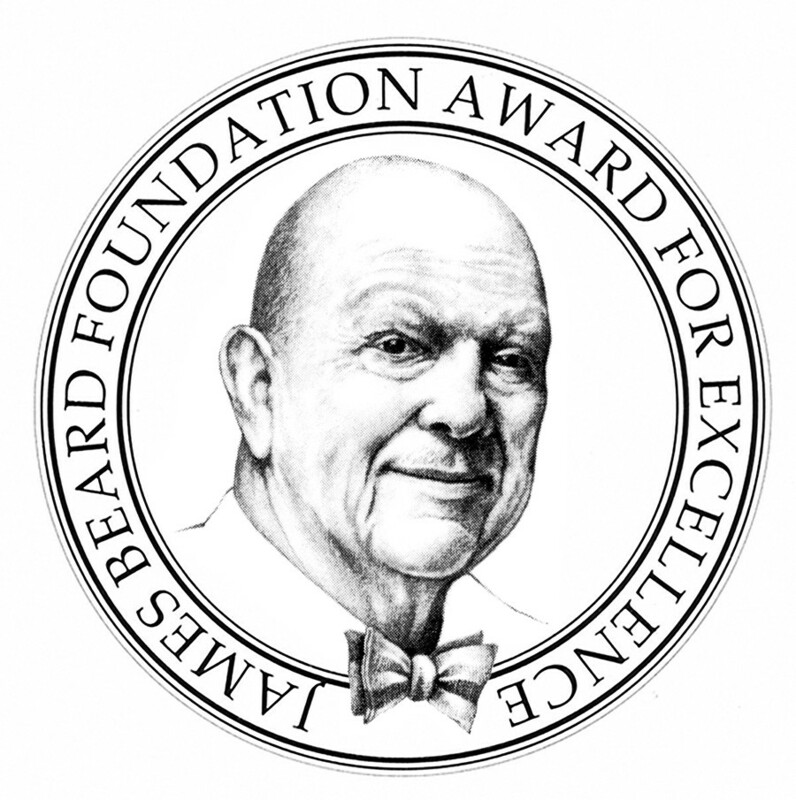 Will save and try it….thank you!! Glorious looking cake. I love it. That’s the prettiest one I’ve ever seen! Reblogged this on Dhong Chul. I don’t dare pretend to speak Spanish, but suddenly I feel the need to learn!